The Dras Valley is an enchanting valley formed by the Dras River which rises in the Machoi glacier near the famous Zozila Pass. The river is joined in its course by many other rivers and streams flowing in from snowfields in the nearby mountains. Drass (3230 m), 60 km west of Kargil on the road to Srinagar, is a small township lying in the centre of the valley of the same name. It has become famous as the second coldest inhabited place in the world by virtue of the intense cold that descends upon the valley along with repeated snowfalls during winters. Winter temperature is sometimes known to plummet to less than minus 40 degrees. The river Shigar flowing in from the north drains an adjoining part of the Dras Valley. In summer, as the snow in the upland smelts, the volume of this river rises considerably. It meets the Suru River near Kharul a short distance away from Kargil.The terrain is characterized by rock and stone with the occasional greenish patch formed by willow and groves. There is a short summer season in the Dras Valley. It begins inMay, when the snows begin to melt. Crop sowing activities startlate, while harvesting is done early so that the crops arebrought in before the beginning of snowfall. Barley and other coarse cereals are the main crops grown inthis valley. Agricultural production is hampered due to thepoor and unproductive soil and the short growing season. Moreover, there is a lack of irrigation facilities in many parts of the Dras Valley. As a result, agricultural yields are not enough to meet theneeds of the people living in this valley. Food grains have tobe imported from the Kashmir Valley. Fuel too is a scarce commodity and has to be brought in from across the Zozila Pass.Brokpas are the people living in the Dras Valley. They probably migrated to this tract from Gilgit several centuries ago. Drass is a convenient base for a 3-day long trek to Suru valley across the sub-range separating the two valleys. This trek passes through some of the most beautiful upland villages and flower sprinkled meadows on both sides of the 4500 mts high Umbala pass, which falls enroute. The trek to the holy cave of Amarnath in neighboring Kashmir, which stars from Minamarg below Zojila, takes 3 days and involves crossing of 5200 mts high pass. 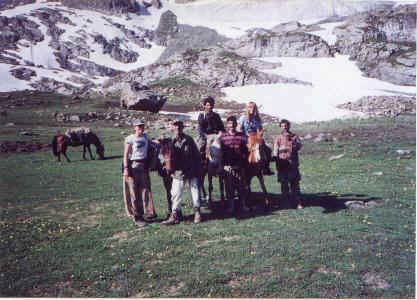 Drass also offers numerous shorter treks and hikes to the upland villages. 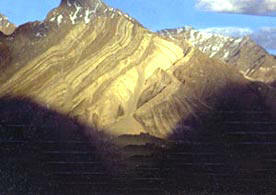 The Drass valley starts from the base of the Zoji La pass, the Himalayan gateway to Ladakh . For centuries its inhabitants are known to have negotiated this formidable pass even during the most risky period in the late autumn or early spring, when the whole sector remains snow-bound and is subject to frequent snow storms, to transport trader's merchandise across and to help stranded travellers to traverse it. By virtue of their mastery over the pass they had established a monopoly over the carrying trade during the heydays of the Pan-Asian trade. A hardly people enduring with fortitude and harshness of the valley's winter, the inhabitants of Drass can well be described as the "Guardian's of Ladakh's Gateway". 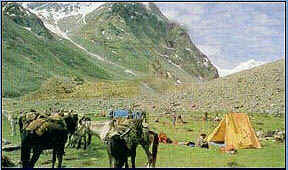 Drass is a convenient base for a 3-day long trek to Suru valley across the sub-range separating the two valleys. This trek passes through some of the most beautiful upland villages and flower sprinkled meadows on both sides of the 4,500m high Umbala pass, which falls enroute. The name Nubra is applied to the region comprising the valley of the river Nubra and that of the Shayok, both above and below their confluence, where they meander in many shifting channels over a broad sandy plain, before flowing off to the north-west to join the Indus in Baltistan. 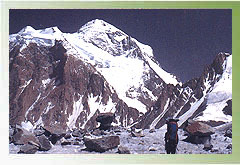 The Shayok and Nubra rive rs drain the east and west sides of the Saser sub-range of Karakoram. The route from Leh crosses over the Khardung-la, the highest motorable road in the world. The line of the road is different from that of the old pony-trail, longer and actually higher (18,300 ft 5,578 m). The view from the top is amazing. One can see all the way south over the Indus valley to the seemingly endless peaks and ridges of the Zanskar range, and north to the giants of the Saser massif. For several kilometers, on each side of the pass, the road, covered by deep snow in winter, is rough. For the rest of the way the road is good. At the confluence of the two rivers there is no dearth of water, but the sandy soil is not suitable for agriculture, which is confined to the alluvial fans where side streams drain into the main valley. The valley floor itself is covered with dense thickets of a thorny shrub, which the villagers use for fuel and for fencing, though there is now less need for this than there was in the days of the caravan trade with Central Asia when up to 10,000 horses a year are said to traverse the district. The villages are large and prosperous, and have thick plantations of willow and poplar. The altitude is a little less than that of Leh, varying between 10,000 ft (3,231 m) at Hundar, and 10,600 ft (3231 m) at Panamik. Summer temperatures vary between 15oC and 28oC.